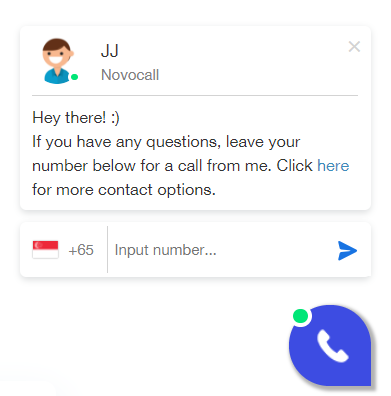 Make Novocall widget your own with a couple of simple design customisations. After installing the Callback widget on your website, it's time to customize the appearance of your widget. It’s easy to introduce your team in a personal, friendly way. Here's an example of how the Greetings will look like on your website. By default, your visitors will be greeted with "Hey there! :) If you have any questions, leave your number below for a call from me." Navigate to "Widget Settings" > "Greetings Page"
You can edit your greeting to better serve your customers. Some quick tips, keep your message personal and your customers will be delighted! Office hours set your customers’ expectations for the time taken to get back to them. When a customer opens the widget outside of office hours, they’ll see a scheduled callback page to schedule a call with you during your working hours. Of course, the call will be automated. By default, your office hours are set to weekdays from 9am to 5pm. You can edit your office hours - just choose the days and times you’re in the office. Note: Your office hours are calculated based on your widget's local timezone. Styling can be found under "Widget Design". Just click the ‘upload button’ then select your logo to add it. And choose a colour for your widget. Check out our guide on testing your widget to make sure it works perfectly.